Daphne plants can be grown in pots, it is essential to make sure that the pot remains cool and the potting mix moist, but well drained. Pots are great near doorways when flowering, however they will, need shade. A few varieties actually prefer sun and some require extra lime in the soil. Despite what you may read, not all varieties are fragrant. Most Daphne plants prefer a cool, shaded position and a moist well composted soil. Good drainage is essential, and although shade is important, deep shade should be avoided. Mulch should be kept away from the base of the plant, yellow leaves are often a sign of poor drainage and or collar rot. One of the major problems with daphne plants is over watering, when grown in a protected shaded position in good soil they actually need very little water at all. Varieties such as Genkwa and Cneorum need different conditions. Daphne can be propagated from cuttings, from seed or by layering. Cuttings are fairly easy if you follow these 10 steps. The best time to take Daphne cuttings is in early to mid summer, you need to use new growth that has commenced to harden a little. Choose stems that have not flowered. Look for stems that will give you a 6 inch (15cm) cutting. Remove the foliage from the lower 1/2 to 2/3 of the stem with a sharp knife so as not to rip the bark from the stem. The lower part of the stem can them be dipped in honey to help promote root growth. A propagating mix of 50% sand and 50% peat moss is suitable. 50% perlite and 50% peat moss is also good. Use a pencil or stick to make the planting hole, insert the cutting at least 3 inches (7 cm) deep. Firm in and water with a liquid seaweed fertiliser. You will need to provide some humidity, so a propagating box, or plastic bottle over the top will help. The cutting needs to placed where it receives good filtered light, however not direct sun. – Check regularly for moisture and mist spray to maintain humidity. Daphne cuttings should have good root development after 3 months. – Do not be tempted to check for root development by pulling on the stem, wait for signs of new growth. Small leaved daphne and large leaved daphne varieties are available, evergreen and deciduous daphne are also available. Many are suitable for growing in the garden or in pots. A number of dwarf species and cultivars are available including D.Cneorum. Recent releases include Daphne ‘Eternal Fragrance’ (Daphne x transatlantica) which is a little more tolerant of sun than others. Varieties or species available for sale include the popular D. odora. 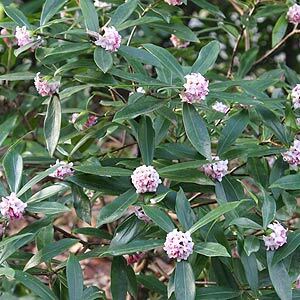 However look for varieties such as Daphne x burkwoodii, D. cneorum, D. collina and Da. Genkwa. Mail order nursery specialising in auriculas and primulas.